Top row from left: Tony Blair; father Leo; Thomas Ridgway Bridson senior; Thomas Ridgway Bridson junior; Paul Bridson. 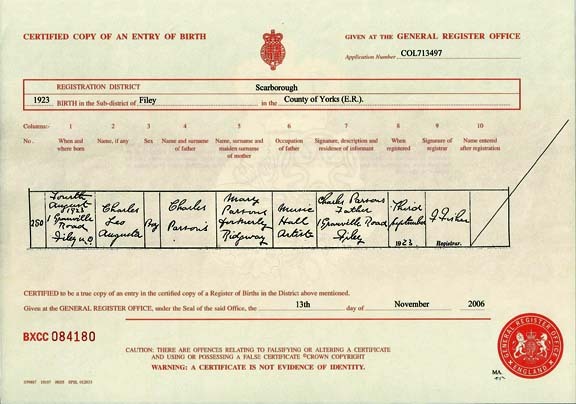 Above: birth certificate of Charles Leo Augusta [sic] Parsons, who was adopted as a baby by a Glasgow couple. 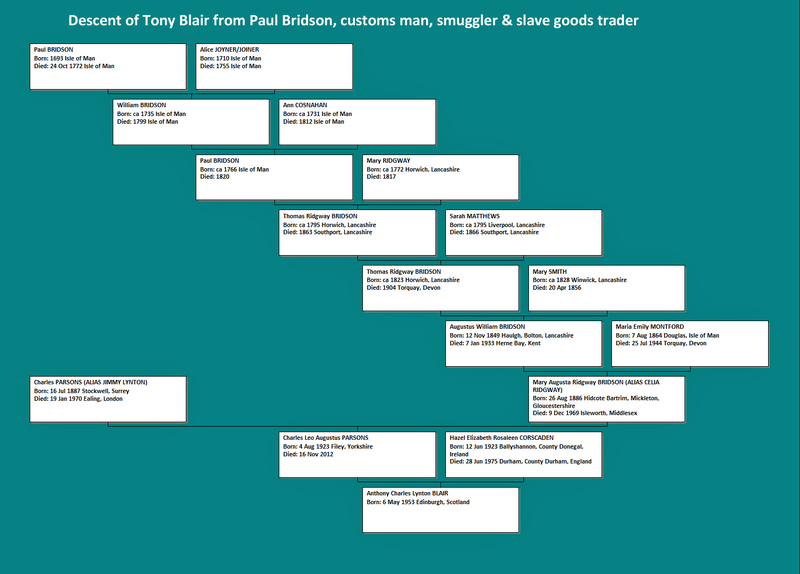 Below: a chart showing the descent of Tony Blair from Paul Bridson (1693-1772). THE family tree of former prime minister Tony Blair is every bit as colourful and intriguing as his decade in office, which was frequently riddled with controversy. His ancestry has been claimed to include kings, philanderers, wealthy industrialists and music hall artists. A published tree in a national newspaper some years ago indicated royal descents from Edward III, William III and James V of Scotland. However, I have so far been unable to check these claims conclusively. Instead, I have concentrated this blog on one particular line about which I have no doubt – that of his paternal grandmother, Mary Augusta Ridgway “Gussie” Bridson, a remarkable character from a wealthy, privileged family who was married three times and gave away Blair’s father, Leo, soon after he was born to a humble Glasgow shipyard worker and his wife. “Gussie” Bridson was a descendant of another very controversial character, one Paul Bridson (pronounced Bride-son), Tony Blair’s sixth great grandfather, who spent many years in the 18th century on the Isle of Man in the anomalous position of being both a customs officer, charged with upholding the law, and a smuggler with strong links to the slave trade. Bridson (1693-1772) was a major importer into the island of what were known as “Guinea goods”, destined to be collected by slave ships operating out of Liverpool and to be used as barter in exchange for slaves on the West coast of Africa before they were transported across the Atlantic to the New World. Paul Bridson’s more immediate descendants crossed the Irish Sea to settle in Lancashire, where they became owners of the world’s largest bleaching works, supplying the cotton industry, and among the wealthiest families in the land. I cannot help wondering whether Tony Blair’s financial acumen – and it’s been claimed he has amassed a fortune of some £75 million since leaving office – owes more to nature than nurture, as the old saying goes? Indeed, is it all in the genes? Anthony Charles Lynton BLAIR was born on 6 May 1953 in Edinburgh, Scotland. 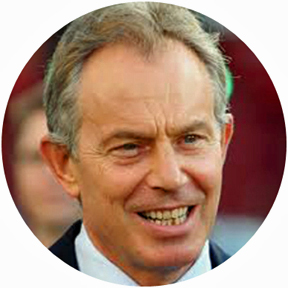 He became leader of the Labour Party (subsequently called New Labour) in 1994, won a landslide victory in the General Election of 1997 and was Prime Minister of the United Kingdom from 1997 to 2007, becoming at 43 the youngest prime minister since Lord Liverpool in 1812. 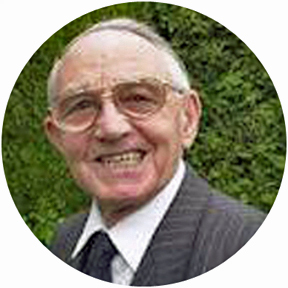 Charles Leo Augustus PARSONS (known throughout his life as Leo) was born on 4 August 1923 in Filey, Yorkshire. His birth certificate actually showed his full names as Charles Leo AUGUSTA Parsons but I suspect this was a clerical error by the registrar. He was fostered as a baby by James Blair, a Glasgow shipworker, and his wife Mary, who was a staunch Communist. The circumstances of his adoption were somewhat bizarre and are detailed below under the entry for his parents. As a boy, Leo worked as a copy boy on the Communist newspaper, The Daily Worker, and became Secretary of the Scottish Young Communist League, but later he switched sides and became active in Conservative Party politics. He studied law at the University of Edinburgh and became a barrister, then a law lecturer. He married Hazel Elizabeth Rosaleen CORSCADEN on 29 November 1948 in Glasgow. Leo died on 16 Nov 2012 at the age of 89, having married for a second time following the death of his first wife. Hazel Elizabeth Rosaleen CORSCADEN was born on 12 June 1923 in Ballyshannon, County Donegal, Ireland. She died on 28 June 1975 at the age of 52 in Durham, County Durham, England. Charles PARSONS, also known by his stage name of Jimmy Lynton, was born on 16 July 1887 in Stockwell, South London. He was a music hall artist, actor and escapologist. Leo Blair’s mother was Mary Augusta Ridgway BRIDSON, Tony Blair’s natural paternal grandmother, who was one of the most intriguing and colourful characters in the Blair family history. She was known as Gussie and also by her stage name of Celia Ridgway. A national newspaper once described her, in a profile of Tony Blair’s family tree, as a “man-eating, thrice-married actress”! She was born on 26 August 1886 in a little village called Hidcote Bartrim in the parish of Mickleton, Gloucestershire, the daughter of a retired army officer and wealthy land owner. She married firstly, at the age of 18 or 19, to a man called Cyril Wolferstan Tordiffe and had two daughters by him. A divorce followed and she remarried in 1915 to a photographer, Hugh Alexander Wilson, and had another daughter by this marriage. However, she went on the stage and began an affair with Charles Parsons, as a result of which Leo Blair was born and Gussie/Celia was again divorced. The likelihood is that the address given on Leo’s birth certificate, 1 Granville Road, Filey, Yorkshire, was either a bed-and-breakfast or private accommodation where Charles and Gussie were lodging while appearing at a theatre in the seaside town. It’s been said that they later met James and Mary Blair while playing in Glasgow and gave little Leo away to be fostered when he was only two months old. Mary Blair was an ardent Communist and the couple brought Leo up in the Gorbals district of Glasgow. Many years later, after Charles Parsons and Gussie had wed, they attempted to get him back, the story being that Leo was due to come into a substantial inheritance from his real family. However, the fiercely protective Mary Blair had cut him off from all links with his natural parents and they were even told he had died in World War II. Leo eventually changed his surname by deed poll from Parsons to Blair. Charles and Gussie married on 2 June 1927 at Southwark Register Office, both being described as actors. Interestingly, one of the witnesses was Pauline Tordiffe, Gussie’s daughter from her first marriage. Gussie died on 9 December 1969 at Isleworth, Middlesex, aged 83, and Charles died on 19 January 1970 at the age of 82 in Ealing, London. 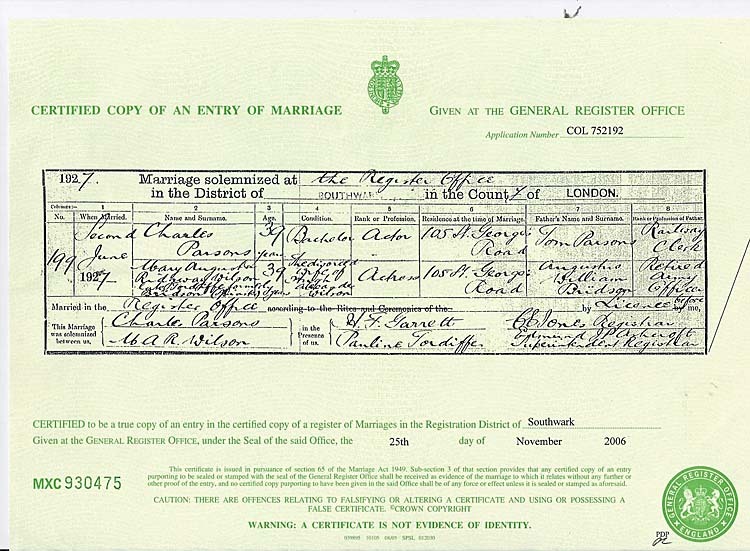 Marriage certificate of Charles Parsons and Mary Augusta Ridgway Wilson, “late Tordiffe, formerly Bridson”, at Southwark Register Office in 1927. The couple were married almost four years after they had given away their son Leo. Augustus William BRIDSON was born on 12 November 1849 in Haulgh, Bolton, Lancashire, a member of the Bridson family who were very prominent bleachers and factory owners in the Bolton area. He was an army officer, a lieutenant in the 13th Regiment of Foot. He married Maria Emily MONTFORD on 9 September 1885 in Edinburgh, Scotland. Augustus died on 7 January 1933 at the age of 83 in Herne Bay, Kent, having lived in a number of places. A newspaper report said he left his wife and child for a mistress. The only evidence I have found for this claim is that in the 1911 census he appears at the age of 61 in Herne Bay in the same household as a young woman who was said to be a widow of 23, who he claimed was his daughter. I have checked the woman concerned and she clearly wasn’t his daughter! His legal wife Maria Emily was still alive at this time and living elsewhere. Maria Emily MONTFORD was born on 7 August 1864 in Douglas, Isle of Man. She died on 25 July 1944 at the age of 79 in Torquay, Devon. She died as Maria E.T. Burton. She apparently lived with a man called Arthur Burton after her marriage ended but never divorced her husband, Augustus. so she must have lived “in sin”, as they call it, for many years. Thomas Ridgway BRIDSON junior was born in 1823 in Horwich, Lancashire. He died in 1904 at the age of 81 in Torquay, Devon, to where he had retired and lived at a house called Rock End. He was a cotton bleaching manufacturer who took over the family business. 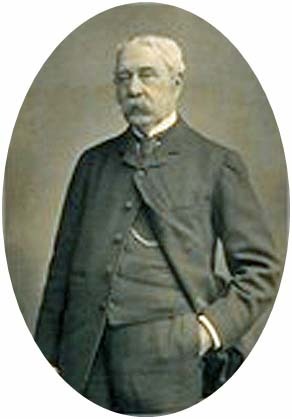 He was the father of Augustus William Bridson. Thomas Ridgway BRIDSON and Mary SMITH were married on 10 Feb 1848 in Urswick, Ulverston, Lancashire. Mary SMITH was born circa 1828 in Winwick, Lancashire. She died on 20 Apr 1856 at the age of only 28. Thomas remarried in 1859 to Charlotte Mary Lowe. Thomas Ridgway BRIDSON senior was born circa 1795 in Horwich, Lancashire. He was baptised on 12 July 1795 in Horwich, Lancashire. He died in 1863 at the age of 68 in Southport, Lancashire. Thomas was a bleaching manufacturer, a Justice of the Peace. Mayor of Bolton in 1847-8, and stood for Parliament in 1849 as a Conservative but was not elected. Thomas Ridgway BRIDSON and Sarah MATTHEWS were married on 20 Mar 1819 in Deane, Lancashire. Sarah MATTHEWS was born circa 1795 in Liverpool, Lancashire. She died in 1866 at the age of 71 in Southport, Lancashire. 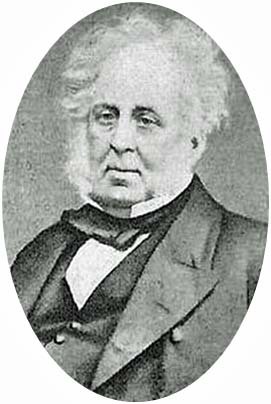 Paul BRIDSON was born circa 1766 in the Isle of Man. He was baptised on 8 Oct 1766 in Douglas, Isle of Man. He died in 1820 at the age of 54. Paul BRIDSON and Mary RIDGWAY were married on 19 Sep 1793 in Deane by Bolton, Lancashire. Mary Ridgway was born circa 1772 in Horwich, Lancashire. She died in 1817 at the age of 45. It was the Ridgway family who first founded the bleach works at Wallsuches, Horwich, in the 1770s. William BRIDSON was born circa 1735 in the Isle of Man. He was baptised on 9 July 1735 in Braddan, Isle of Man. William acted as deputy to his father, Paul Bridson, in his activities and business. He died on 6 July 1799 at the age of 64 in the Isle of Man. He married Ann COSNAHAN on 26 Feb 1764 in Braddan, Isle of Man. 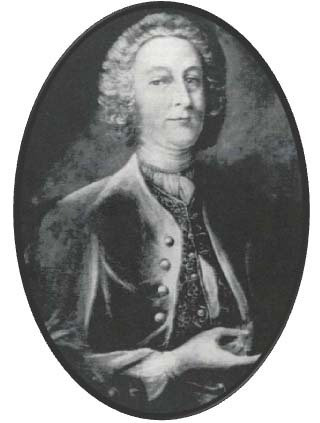 Ann COSNAHAN was born circa 1731 in the Isle of Man. She died in 1812 at the age of 81 in the Isle of Man. Paul BRIDSON was born in 1693 in the Isle of Man. He was baptised on 7 June 1693 in Malew, Isle of Man. Paul Bridson was a Deputy Searcher (customs officer) for Douglas, Isle of Man. He was in the somewhat invidious position of also being a merchant, a smuggler and importer of Guinea goods for the slave trade. He is well documented in histories of the Isle of Man as one of the major merchants and players in supplying imported goods from the East Indies to slave ships operating out of Liverpool. The East Indies supplied both the cloths and beads which formed a major and essential part of the Guinea cargoes. The English East India Company supplies were high-priced, so it was possible to import the less expensive Dutch East India Company goods into the Isle of Man from Holland. Between 1718 and 1764 slaving vessels called at the island to collect the goods en route to Africa. The Isle of Man, because of its location between England and Ireland, was an important staging post for the slave ships and became a sort of warehouse where they could pick up the barter goods before continuing their onward journey to the coast of Africa to collect the slaves. In the 18th century, however, the term “slave trade” was not in widespread use. Instead, it was known as the “Guinea” or “African” trade and the slave vessels were known as the Liverpool Guineamen. Bridson did not himself operate slave ships but he had close links to a number of Liverpool merchants who did. One man in particular, William Boats, a near-legendary figure in the slave trade who captained slave ships in a swashbuckling career, then settled down in Liverpool and operated others, married a daughter of Paul Bridson’s and became his son-in-law. Paul Bridson married Alice JOYNER/JOINER who was born in 1710 in the Isle of Man. She died in 1755, many years before her husband, at the age of 45. Bridson died on 24 October 1772 at the age of 79. 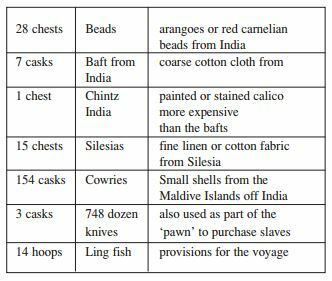 Table of goods imported into Douglas in 1761 by Paul Bridson from a Dutch ship out of Rotterdam and part of the customs record for the goods. They were worth almost a quarter of a million pounds in today’s money. FreeBMD (freebmd.rootsweb.com) which has many millions of birth, marriage and death records from the General Register Office for England and Wales. Findmypast (www.findmypast.co.uk) a major genealogical website which carries all the census records and images from 1841 to 1911. FamilySearch (https://familysearch.org/), the website of the Church of Jesus Christ of Latter-day Saints, for parish register records in the Isle of Man. An excellent and extremely comprehensive book, Manx Slave Traders: A Social History of the Isle of Man’s involvement in the Atlantic Slave Trade, by Frances Wilkins BA, published in 1999 by Wyre Forest Press, 8 Mill Close, Blakedown, Kidderminster, Worcestershire DY10 3NQ. hm my family sure is big…. but in some cases they are wrong in some of what they did but any way thank you for some of the information on my family. I’m afraid you have me baffled! Where is the misspelling of which you complain? Or are you making some other obscure point? If so, where do you suggest I am judging Blair by what his ancestor did? All I have done is present a genealogical line of descent as fact; that is not judging.